Coach Brent's interview with newly committed Kansas State Kicker Matthew McCrane, Class of 2013 kicker from Brownwood HS in Brownwood, TX. Today I had the terrific opportunity of sitting down with Texas native and newly committed Kansas State Kicker Matthew McCrane (Class of 2013 kicker at Brownwood HS in Brownwood, TX). I received a text last night confirming Matthew McCrane committed to Kansas State and I am so excited for him! I’ve known Matt since 2011 where he attended my Dallas Kicking Camp and immediately made a Texas sized impression on the staff. He had the biggest leg at camp and kicked super long field goals and kickoffs and ultimately won the ‘Golden Boot Award’ as the most accurate placekicker at camp. Not only is Matthew’s athleticism impressive, even more so his humility, maturity and strong conviction in his faith. I hope you enjoy this interview as much as I did! Kansas State University has had one of the hottest football programs in the country this year. K State football absolutely dominated through 10 games this year scoring an average of 46.8 points per game! In week 10, Kansas State suffered an upset loss against Baylor in Waco, TX. Even after being ranked #1 in the country, the upset loss toppled their opportunity for a BCS Bowl bid. K State finished up the season strong by beating Texas to close out the 2012 football season with an impressive 11-1 record and a Fiesta bowl appearance vs. Oregon on January 3, 2013. A. In leading up to high school, my dream was to be a Quarterback. I had spent countless hours at camps, with coaches, and learning the techniques of being a QB. In my freshman year of High School, I was moved up to JV, and I traveled with Varsity. I was so excited to finally be a part of one of the best traditions in the state of Texas; HS Football & Friday Night Lights. It was a dream come true! (Kicking had never crossed my mind yet at this point). My sophomore year (2010) came and we had a senior QB, as well as a backup, so me becoming the starting Varsity QB wasn’t going to happen anytime soon. Half-way through my sophomore year there was a hole at the Kicker position. I remember Coach Shipley asking, “Can anyone kick?” I raised my hand and went out to kick in my ‘land sharks’ (a high top football cleat). It had been raining the day before and the ground was wet and as I approached the kick, I fell flat on the ground (LOL)! I had played soccer for a while, so I kicked a football the same way. However, I later learned after watching NFL games and getting good instruction, just how to kick a football the right way. I went out and kicked every day after practice- borrowing balls from the coaches, and working on my craft. Heading into the state playoffs my sophomore year (2010), I was booming kickoffs and Coach Shipley asked me to take over. This was the ‘memorable’ 2010 season as everyone here recalls it. We made it to the 3A State Semi-Final game where we lost to 3x defending champion, Carthage HS. It came down to the last play of the game and it was a heart break. I remember every second of that game. 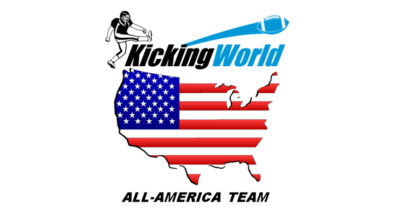 After the season ended, I continued practicing my kicking and attended the Kicking World Dallas Camp. Things shot up quickly from there! Q. Everyone knows Football is BIG in Texas. Tell us about your fondest memories growing up and later as you played football for Brownwood HS. A. If you aren’t from Texas, or have never been to a game here in Texas you can’t really fathom how big it really is! The movie, “Friday Night Lights” is a perfect example of Texas High School Football. Plainly, It’s Life. Growing up, I remember the smoke coming out of the tunnel, the music, and the crowd. The ultimate goal was to be a Brownwood Lion! Q. How did you first start getting recruited by colleges? How did the process develop and when did it start getting more serious? A. My dad and I really worked hard at it after my first season, by sending out highlight videos and stats to all the coaches. We utilized the NCSA network and they really helped to get my name out there. You also sent personal e-mails to your network of college coaches, which certainly helped too. Those two methods got the lines of communication started, but I stayed ‘pro-active’ and followed up with everyone we e-mailed or whoever I knew watched my video. I picked up the phone and called numerous coaches; probably every Division I school you can think of (haha) and remained in contact and stayed relentless. Hitting the 52 yard field goal in the playoffs my junior year got a lot of coach’s interests and ultimately kick started the recruiting process! Q. Talk to me about “the call” from K-State and how it all happened. When you made your commitment to K State where did it happen and what was it like for you and those around you? A. One week before I received “the call” I was in Manhattan, KS for the final regular season game for K-State vs. Texas. Coach Snyder told me to be patient as they were going to have a staff meeting the following week. Throughout that week I stayed in contact and was anxious, nervous, excited, and hoping and praying! Coach Snyder told me that he would get back with me following the Heisman Presentation. On Sunday Coach Snyder called me and told me that they would extend a full offer if I would start in the Spring semester (I’m graduating early). I told him that I was very excited and honored to have this opportunity, but I wanted to discuss it with my parents before I committed. After talking it over with folks, at about 7:00pm Texas Time I called him and formally announced my commitment to Kansas State! Yes, go Wildcats! Coach invited me up for and official visit this weekend and I’m looking forward to it. Shortly after, I called 247sports.com, ESPN, and Rivals.com (all of whom have been calling me and asking if I’ve made my decision yet). Within minutes, my cell phone buzzed nonstop for the next 2 hours with countless texts, e-mails, Twitter Posts, Facebook messages, etc. The last 24 hours have been unbelievable! Q. What ultimately led you to commit to Kansas State University? Also, what other schools were in the mix? Q. Do you have any ‘tips’ for other HS football players who are wondering what they could do to further increase their chances of playing college football and earning a football scholarship? A. Don’t expect a scholarship. I feel that I got lucky, and I happened to be in the right place at the right time. But, you have to be proactive. I know it’s cliché, but it’s true. I called hundreds of coaches- all divisions starting my junior year. I did that on my own. In order to be successful, you have to want it, and do whatever it takes to achieve it; and I did. Q. Is there any person in your life who has influenced you throughout your athletic career, in life or someone you aspired to be like or learn from? A. Tim Tebow. I don’t know if you have read his book, but I encourage everyone to. He is, if not, the best role model for aspiring athletes today in my opinion. If there is anyone that I would want to meet in life; it is Tim Tebow. Regardless of whether or not he starts at QB or any position, he is someone that I aspire to be like. Q. Being a fellow Christian, and getting to know you over the years, I know how important faith is to you. Tell me about your core beliefs and how your faith in God has helped you not only with your success on the football field but also in your daily walk of life. A. One thing I’ve learned is that there are some things you can’t control. What you can control is your attitude, your effort, and your focus every day. And that’s what I try to focus on. I am very strong in my faith as a Christian, and that has helped guide me along the way. Q. What is your favorite restaurant in Texas? A. Humphrey Pete’s, in Brownwood/Early, TX. Q. What is your favorite beverage? A. The ‘Blue Lagoon’ at Triple T Grill in Brownwood, TX. Best drink there is! It’s made up of Coconut Juice, Cherry Juice, Sprite and Cream. Q. What do you like the best at Underwood’s Bar-B-Q? (Underwood’s Cafeteria is a delicious little joint in Brownwood that I’ve had the pleasure of eating before!). Q. Favorite sport besides football? A. I’ll always be a Cowboy fan. Q. Who’s your favorite NFL Kicker? Q. What is your favorite Bible verse? Q. How will you be a successful kicker at K-State and help the team over the next 4 years? A. In order to be a successful kicker, I have to block everything out. Not just on the field, but in class, around town, etc. I have to keep a level head at all times. A. The Big XII atmosphere and playing in different stadiums! Matthew McCrane has accumulated quite an impressive resume for only getting into kicking mid-way through his sophomore year of High School. He kicked a game winning 52 yard field goal as a junior in the state playoffs during his 2011 football season and was honored as an All-State kicker in 2011. In 2012 he not only kicked, but punted and played Wide Receiver! He’s as versatile as they come and K-State should have a very athletic kicker for the next 4 years! We all wish you much success at K-State Matt McCrane! This is an interview conducted on December 10, 2012 between Coach Brent Grablachoff, Owner & Head Coach of Kicking World and future Kansas State Kicker Matthew McCrane from Brownwood, TX.